← Off-piste or piste off? This week, our 1st years finally get to the first plank of evidence for the Big Bang in their introductory course in cosmology. Having covered the work of Kepler, Galileo, Newton and Einstein, and the theoretical debate between Einstein’s static universe and Friedmann’s dynamic one, they have reached the point where it’s time to introduce the first piece of experimental evidence in modern cosmology – Hubble’s law. As every schoolgirl knows, Hubble discovered that distant galaxies are moving away from us (or any other point) with a velocity that is proportional to their distance. This is the crux of the evidence for the expanding universe and a major piece of the evidence for the Big Bang. where v is the recessional velocity of a galaxy, d is the displacement of the galaxy from us and H is the Hubble ‘constant’, or the slope of the graph. The velocity of a galaxy is measured as a Doppler redshift of the light it emits and is relatively easy to measure. However, the measurement of the distance of a given galaxy is trickier (it is done using stars known as Cepheid variables.). 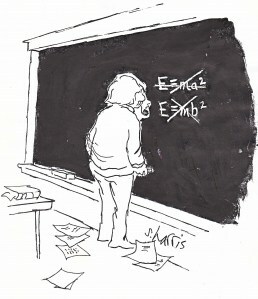 In fact, Hubble had a major systematic error in his distance calculations, an error that was not corrected for decades. Hubble’s graph was an important advance, for it settled the debate between a static and expanding universe (leading Einstein to label his cosmological constant, introduced to the equations of GR to force a static universe, ‘his greatest blunder’). The graph also immediately hinted at a universe that might once have been very much smaller – perhaps even as small as an atom, as first suggested by the mathematician Georges Lemaitre. (To see this, trace your finger down the slope of the graph towards the origin). This is the model now known as the Big Bang model of the origin of the universe. However, one problem with the new model immediately emerged. It is easily shown that the age of such a universe can be calculated as the inverse of the slope of the Hubble graph (1/H): unfortunately this calculation gave an answer that was far younger (not older) than the known age of some stars! This observation severely weakened the Big Bang hypothesis and it was only years later that it was discovered that the error lay in Hubble’s estimation of stellar distances (the x-axis). Nowadays, estimates of the age of the universe from updated and expanded Hubble graphs agree exactly with the age calculated from several independent phenomena. 1. Of course the galaxies aren’t really moving at all. General relativity predicts that it’s really space that’s expanding and the galaxies ride the wave.